Designing your own products is a hot trend among shoe manufacturers. I structured this portfolio exercise so that the students could choose what they designed (from soccer cleats to diamond rings) then critique the experience. We completed this exercise in one class period, the students enjoyed it, but I’m not sure exactly what they learned about design from the experience. Our biggest item of the week, we took a day long field trip to the Museum of Design Atlanta (MODA). 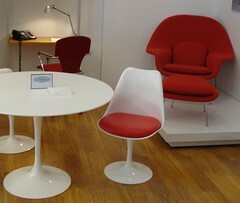 Their current exhibit fit our needs perfectly: they were showing the furniture of Eero Saarinen. We had the chance to examine up close and even sit in a number of Saarinen designs. The mid-century modern style is a lot of fun to show kids because it’s got a Jetsons feel. This exhibit was awesome because we got to sit in the chairs. Going to a museum to stand at a distance from the furniture would’ve been little better than looking at pictures on the web. Several students commented that the museum was smaller than they expected. When we returned, we investigated several terms our guide mentioned: the Bauhaus, Ray and Charles Eames, as well as Eero Saarinen. This was a very useful exercise. Check out what they chose to summarize on our Wikispace discussion. Saarinen furniture photo courtesy of idogcow’s Photostream on flickr. The portfolio entry under this title said to choose a household item, go to a cafe with pen and paper, and design an improved model. My students and I drove to the local Starbucks and wrote about all sorts of improvements. One senior wrote about his annoying personal fan. Apparently it’s got a rattle he’s not fond of. So he designed a way to quiet it. He’s also not happy with the placement of the controls (on the back). Another described problems with getting the shower temperature just right. He came up with an easy mechanical pre-set method. We enjoyed the change of venue, to be sure. Several students really got into the exercise and had great ideas. Others needed lots of help getting started. Choosing the correct scope was important on this one. Some kids thought too big to be doing any design work in the coffee shop.